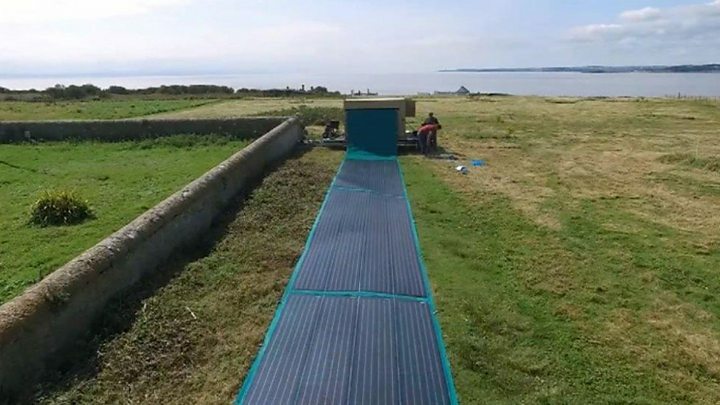 Roll-up solar panels are being used to help power an island off the coast of Cardiff. The Rapid Roll system allows flexible solar panels to be unrolled like a carpet from a trailer in two minutes. The pioneering technology aims to meet demands from increased tourism and environmental and logistical challenges on Flat Holm. The hope is for the technology in future to offer a solution in areas hit by natural disasters like hurricanes. This is the first time the system has been used in Wales and it is the first long-term deployment of the technology anywhere in the UK. The technology was developed by John Hingley, managing director at Renovagen, based in Milton Keynes, Buckinghamshire. He came up with the idea of scaling up the concept of mobile solar technology while away travelling five years ago. By making the panels rollable, a much larger power capacity can fit into a smaller box. So a 4x4's trailer can take enough solar panelling to power a 120-bed mobile clinic or to desalinate 25,000 litres of sea water every day. "Compared with traditional rigid panels, we can fit up to 10 times the power in this size container," said Mr Hingley. Provides an average of 11KW of power, enough to provide electricity for four people living on the island and visits from tourists. Its batteries can store 24KW/h of power, about a day's worth of energy use on the island. Panels have a 10-year life span. Flat Holm in the Bristol Channel, a site of special scientific interest for its plants and birdlife, was once the location for a cholera sanatorium and was where Guglielmo Marconi transmitted the first wireless signals over open sea in 1897. It does not have a mains supply and the island previously relied on a combination of diesel generators and older style solar panels to provide electricity. According to Flat Holm team leader Natalie Taylor, providing electricity for the island is a challenge. "As we promote the island more and we get more visitors here, there's going to be a lot more demand for electricity so it's really important that we've got a really high functioning system that can provide for those people," she said. "From an environmental point of view we want to reduce the use of diesel generators so that we can have as small an ecological footprint as possible." The technology has been deployed after Renovagen won a small business research competition run by Cardiff Council last year to find innovative ways of using renewable energy. Gareth Harcombe, energy and sustainability manager at Cardiff Council said: "We were looking at solar and hydro, but that takes up a lot of land and land in cities is expensive. "But there is a lot of land that we have that's available whilst it waits for other opportunities. So this was a question about how we could generate electricity in a way that was portable, so once the site is needed for something else it can be moved on." The local authority is also using the portable solar panels to charge electric vehicles at its Lamby Way recycling centre.